KAWASAKI has unveiled its latest incarnation of the Versys 650 which features a number of upgrades for 2015. Like the new Versys 1000, the 650 gets dual headlights and new fairings to improve wind protection and aerodynamics. Fitted to the rear of the bike is a Z1000SX-style LED taillight. The 649cc parallel-twin has been retuned to increase performance further up in the rev range whilst improving fuel efficiency at the same time. The 41mm suspension now has ‘separate functions’ for each tube, allowing all adjusters to be mounted to the top of each fork for easy adjustment. Stopping power has been upgraded too, with new calipers, revised master cylinder settings, new brake pads and a larger 250mm rear disc. The 650’s touring capabilities have been improved by way of an increased payload, a new 21L fuel tank (previously 19L), a hand-adjustable windscreen, and a stronger subframe which allows the use of clean-mount panniers and a top case at the same time. The latest incarnation of the Versys 650 has been launched by Kawasaki at the prestigious Intermot motorcycle exhibition in Cologne, Germany. 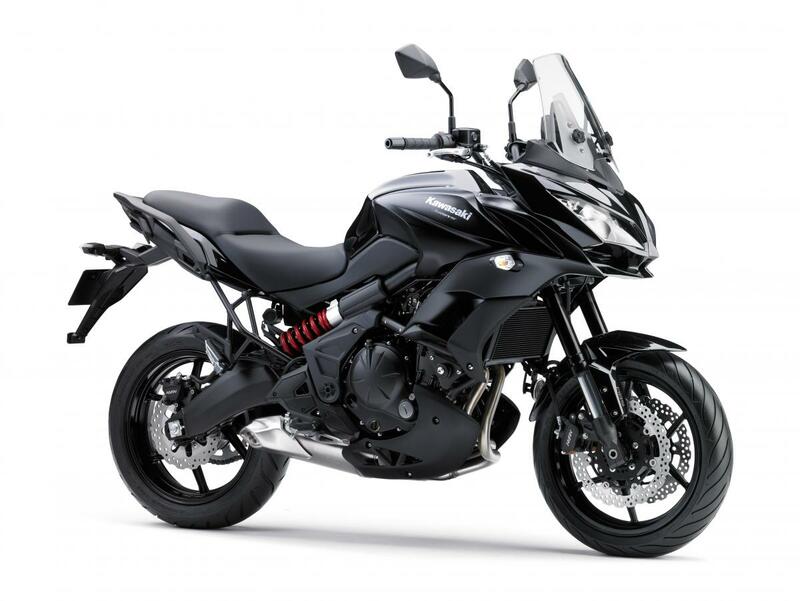 The Versys 650, already popular for its multi-purpose capabilities and its fun character, has been redesigned to reflect the sporty range-wide Kawasaki DNA and has received a multitude of upgrades for 2015. A fresh new look has been given to this all-around machine, uniting both design and a fun and sporty character to create the ultimate Versys 650. The Kawasaki family styling is prominent in the dual front headlamps and the new cowling, which not only look the part but also improve wind protection and aerodynamics. The proven 649cm3 engine retains its familiar low and mid-range torque, essential for daily riding and two-wheeled fun, but has received a boost in the high rpm performance to enhance its sporty character. Fuel efficiency has also been improved to ensure hours of enjoyment on any street. Upgrades have been made to the long travel 41mm suspension which now has separate functions for each tube, allowing all adjusters to be at the top of the fork for easy personal refinement. New bike-specific settings contribute to both light handling and ride comfort. The rear suspension features an easy-to-access remote preload adjuster aiding effortless fine-tuning for pillion riding or load-heavy outings. Adding to the many upgrades the new Versys 650 boasts, the stopping force of the new motorcycle has also been enhanced. New calipers, revised master cylinder settings, new brake pad material and a larger φ250 mm rear disc all deliver increased controllability, stronger initial bite and greater overall brake force. However, the Versys 650 is not only about daily commuting and solo riding. This bike will devour long distances, alone or in the company of a pillion rider. Keeping this in mind, the touring capabilities of the Versys 650 have been improved by increasing the payload, allowing riders to take more with them and by including many useful accessories in the Kawasaki inventory. A stronger rear frame allows accessory clean-mount panniers and a top case to be used at the same time. An all-new larger adjustable windscreen offers comfort and protection to riders using simple hand-adjust knurled wheels. The fuel tank now holds 21L of fuel (previously 19L) so highway cruising or twisty excursions needn’t be interrupted by frequent refuelling. Already with a loyal following, for 2015 the new Versys 650 goes the extra mile and stands proudly among the Kawasaki model range embodying the true meaning of a multi-tasking motorcycle. Discover the exceptionally versatile Versys 650, for everyday or weekend fun, ride longer and farther in comfort and in unique Kawasaki style.